Continued Innovation sets us apart. Here is a short review of the Metalock process - covering what it is and how it works; followed by a brief history of metalock and comparisons to other methods. Cold repair methods evolved to: 1.make safe predictive repairs in environments that are dangerous when exposed to flames/ high temperatures or sparks. 2. overcome problems associated with welding [such as material embrittlement, introduction of new stresses/further cracking, dismantling, warpage, fumes, post weld clean up and machining.] 3. make lasting repairs onsite. Many companies’ trade off the Metalock name by suggesting: “Metal stitching or metalocking as it is called in some parts of the world, have become generic phrases that describe methods of repairing cracks in cast metals without welding.” Do not be misled. The Metalock material, processes and tooling are unique to Metalock. Maintaining production/ reducing down time of important plant is our focus; experience, capacity and due diligence ensure safe and reliable repairs. Metalock is recommended and endorsed by major OEM’s, insurance underwriters, classification societies and inspection services. A drilling guide is attached / positioned perpendicular to and across the crack. A hole pattern is drilled and repeated at intervals from15mm to 30mm apart. The major portion of the metal is removed by using a drill bit that corresponds to the lock size ie a 5mm drill is used for a 5mm lock. To achieve the correct spacing for the holes a special drilling jig is used in 1/8", 5/32", 5mm, 1/4"or 5/16” configuration [size depends on casting thickness]. The first hole is drilled in the centre of the crack. A hardened pin is fitted to this hole to anchor the jig / guide in position while the far hole on one side is drilled and also pinned. Then the remaining holes are drilled. Then pins and jig are removed. Drill holes are normally balanced across the crack to provide equal strength on each side of the crack. The minimum number of holes drilled is normally 5 - alternating to 7 on next lock. [Note: Number of lugs is usually an odd number 5, 7 though 7 and 9 – even 11 are sometimes used – an even number is sometimes fitted when attaching a steel part to cast iron or when access does not allow]. 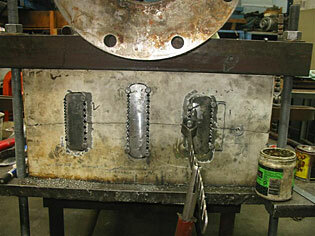 Locks are cut to required length from preformed bar stock that is approx. as high as it is wide. Drilling depth is limited to no more than 90% of the casting’s thickness in order to provide a base for the lock to be set against. After the holes have been drilled, a web of metal remains between each hole. The webs are partially removed with sizing blades. The stock removed is narrower than the drilled holes and forms a serrated aperture ready to accommodate the lock. Preformed Nickel alloy metalocks having a slight interference fit to the slot are driven in with a thin-bladed tool until they bottom out to create a bridge across the cracked sections The lugs are then peened to lock it into the casting. Locks [parallel in form] are stacked in order to fill the slot to a depth limited by the casting thickness and determined by the strength required. This material is specifically chosen because it is both strong enough to take shear loads and ductile enough to provide the necessary elasticity. The last lock installed sits slightly above the surface of the metal, and is peened to interlock the casting and metalock key. After fitting the locks, special threads are placed along the entire length of the crack [these prestress the keys, prevent the leakage of liquids and gases and stop movement of the casting]. Standard procedure is to install a thread at each end of the crack to minimize further crack growth. After each key is installed, threads are placed on either side of the lock / centred on the crack. Then threads are fitted to any remaining crack between the locks. The holes are tapped in order to accept the special soft bolts or threaded rod which are matched to conditions and materials as required. 3 different thread materials may be used as standard – ranging in 7 different sizes and thread pitch. [We roll our own threads and make our own Masterlocks, jigs and tooling]. Sealant is used on Metalocks and metalloy threads when liquid or gas containment is required. In thicker castings larger inlays of material called Masterlocks are fitted. These can be any length / width and depth. i.e. 200mmL x 70mmW x 60mm”D. 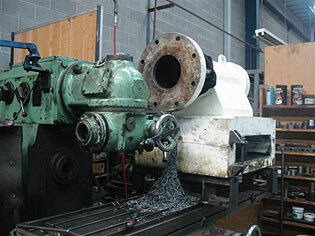 The shape, size and material are matched to the requirements of the casting repair. The purpose of Masterlocks is to provide a higher concentration of locked strength at points of maximum stress, particularly where it is necessary to dissipate a local stress over a wider area. The area in which a masterlock is to be installed is drilled along its perimeter using a chain drilling jig to provide uniform spacing. Internal areas within the perimeter are then excavated leaving a series of half holes in the casting which are subsequently matched to the other half in the Masterlock. Or sections are milled out and Masterlock block fitted and jig drilled in place - then tapped, padded and secured in place. Finally, the area which has been metalocked is ground level to the surface of the original casting creating a seamless repair often indiscernible from the parent material when painted. The Metalock process began in the late 1930’s for repairing cast iron components and equipment on the oil fields of Texas. The process was created to provide permanent and stress-free repairs. And was especially useful in areas where use of heat or open flame was unsafe. [The same applies today] Three men developed this new technique - L.B. Scott, Fred Lewis and Earl Reynolds. The first Metalock job was implemented with hand crimped indentures, [known today as locks or keys] and received slots drilled by eye. Today jigs are used. Come 1937 and L.B. Scott was credited with this invention and secured patent rights to the repair technique and materials used. L.B. Scott then began to offer franchises under the Metalock Corporation trade name after first starting his own operation in Long Island City, NY. Not long after Thomas O. Oliver Ltd. (based in Ontario, Canada) became the first company to purchase a franchise. In 1942 Fred Lewis (who helped develop the process) purchased a franchise and operations began in Chicago, IL. Later that same year - George Jackman Sr. formed Metal Locking Service, Inc.
Another 2 years and Earl Reynolds (the other partner in the development process) started an operation in Tulsa, OK. Also in 1944 Herculock Limited was formed by Thomas Oliver. Metal Locking Service was incorporated in Buffalo, NY in 1946. Here George Jackman Sr. was credited with the invention /development of the Masterlock technique. Whilst L.B. Scott held the patent and franchise rights to Metalock, the franchisee had to pay 10% royalties on all sales. These patents expired in 1953. Individual franchises developed and marketing independently. In 1953 the Metalock International Association was formed by 7 companies. Including Metalock of Australia P/L. Of course there were other cold repair methods introduced in these periods and even before i.e. - Crack repair methods in the days of Model T and Model A Fords. Tapered screws came in the 1930s [similar to irontite / Repco plugs] Harman locks in the 1940s, Murphy locks of the 50’s, and later in the 80’s-90’s ironstitch locks and LNS locks /plugs. In 2006 Metalock introduced yet another key material - Designated MN555: features include higher tensile strength, greater corrosion and heat resistance. Comparison between Metalock and certain stitching processes. Everyday our technicians repair cracks on complex contours, on inside and outside of corners, and near edges using our special screws and locks. The ductility of the nickel material we use means we do not need flat spots to fit our keys – the very nature of castings and where they fracture often obfuscates such conditions. Our unique range of experience, materials and tooling allow us to perform highly sophisticated repairs. Sure we mill out sections to fit larger Masterlocks as part of the repair [as per pictures below] – and we have onsite machinery that will do the same – but probably 95% of the time spent getting the insitu unit into place and setting it up negates any time benefits and we often cut sections out by Auto-push drills or by hand – quicker, more cost effective. Also these onsite equipments are either hydraulic / electrically driven - with all the issues and problems that raises. Then there is the question of access and room to fit this equipment [And LNS have to use insitu gear for their larger locks] - sometimes it just isn’t there. LNS use inexpensive materials in their locks– 4130. Yet their costs are high – probably due to the complex, expensive and time consuming tooling [which still can’t replicate the versatility of the Metalock system]. And complex it is – “LNS locks must be installed flat. Use C Series pins on curves. It is often easiest to use L Series pins next to the locks and then continue the repair with C Series pins.” LNS Pins/Screws installation tooling includes roughing taps, bottoming taps, finishing taps, chamfer tools and spot facing tools even Piloted taps. We use bottoming taps exclusively, and generally maintain the same screws throughout the repair. Matching materials to applications is another point. A lot of talk about coefficiency of expansion gets bandied about. Naturally this is only relative to applications where high cyclic rates of major temperature fluctuation occurs [which would be less than 3% of our work]. A typical application would be repairs in the combustion “chamber” of diesel cylinder heads-and here our Metalock repair success rate is unsurpassed. Our repairs have lasted for decades in this harsh environment - only seeing the light of day when reconditioning work is required or engines have run out of water through welch plug failure, dropped radiator hose, etc. The problem with LNS locks is the maximum width to minimum width ratio – requiring further spacing between their locks and standardised length of their material which can set up an artificial fault line. Also they use only one material – 4130 steel whereas we have a few different lock materials as standard [make up stainless steel and bronze Metalocks for special situations] and manufacture Masterlocks in a broad range of materials [And sizes] to suit the job. The threads we use come in several different materials, sizes and thread pitch to suit the job at hand – as versatility is so important. Here are a few more comparison points between Metalock and LNS. Lack of speed. To use LNS process as per their multitude of convoluted steps is slow. [Sure their big screws take up more area – but that brings its own problems] Expense. If you get USA staff here to do a job – even using the exact same process as us, the costs must be higher. Travel, accommodation, freight/cartage, lack of local knowledge on where to source locally and know the alternatives available are real issues [We work overseas a lot so understand these concerns intimately]. Of course you can use the people they sell the product to. These local repairers [often sole traders] have neither the Experience nor infrastructure required to ensure repairs are as good as they can be. Capacity is another difference. We are part of a worldwide group, The Metalock International Association – that benchmarks at conferences every year in different parts of the world to discuss trends, R&D and interesting Metalock jobs.